Do not put off by the title, actually it is a very tasty dessert that combined ice and porridge together. I like this so much since I was still a little kid. Green Soya or Mung beans are commonly used in Chinese cuisine, as well as in Japan, Korea, India, Thailand and Southeast Asia. 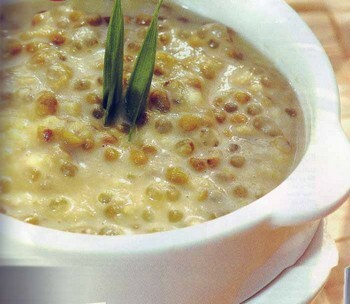 Now it is made into a dessert snack called Green Soya Porridge, which has the consistency of porridge. The beans are cooked with sugar, coconut milk, and a little ginger. Green soy has a lot of Carbohydrates and Protein. 1. Clean the green soy beans. Then cook it with water until it’s really tender (like porridge). It is necessary to add more water if it's not soft yet. And stirring it well while cooking. 2. When the green soya is already tender, add coconut milk, vanilla sugar then pandan leaf. By the time the coconut milk is half left, add the sugars (white and brown) and salt. Keep stirring it so it won't burn. 3. Cook until it's thick like porridge. 4. Make the coconut sauce by boiling all the ingredients. 5. Serve the green soya porridge with the coconut sauce on top.